We’ve documented 44 new shoes from 12 shoe brands. As usual, we’ll be making videos so you can hear from the designers directly, but until then we have photos and over 3,000 words written about the new models. All of this was captured during the Outdoor Retailer Summer & Winter trade shows that featured 2018 gear. The Boreal Dharma has been updated with a lined synthetic leather upper and a wider opening to get your foot in/out. The toe patch also got updates with a design meant to reduce pressure points. The Dharma is a little stiffer than an aggressive bouldering shoe would be, so it’ll be best suited for steep sport climbing. Men’s (wide) and women’s (narrow) lasts available. The Boreal Satori is now a synthetic leather shoe with a smaller volume last. The toe rubber is connected to the rand to completely cover the toe. This connection this will prevent any glue problems and allow the shoe to be more sensitive. A larger and wider velcro opening will make it easier to get into the shoe. The heel is also upgraded to be more sensitive. To increase sensitivity in the shoe, there is no mid-sole in the toe-box. Men’s (wide) and women’s (narrow) lasts available. The Boreal Synergy shoe is one of the narrowest climbing shoes in the Boreal collection, it’s a slipper with two velcro straps and a wide opening. It has a very similar rubber to the Mutant on the toe and heel. The lack of a midsole makes it incredibly soft and sensitive. Designed for bouldering, competition, or roof climbing and other volume problems where body tension is critical. We got the low-down on Black Diamond’s new shoe line from the two main designers on the project: Linh Nguyen and Kasey Jarvis. Linh has an extensive background designing climbing shoes since the 90’s when he was at Boreal and later at Evolv. Kasey worked as a shoe designer in Nike’s Innovation Kitchen for 7 years before moving to Black Diamond. Why shoes? Black Diamond wanted to finish out their climbing range and also felt that they could bring a unique offering based on their engineering knowhow. This can be seen in shoe features like their molded soles and laminated features. The team also took a page from Nike’s playbook developing new knit uppers designed specifically for climbing shoes, combining 2 blended layers of polypropylene and polyester that are more breathable and comfortable than typical upper materials. The Black Diamond Momentum is an entry level shoe that will be available in lace or velcro. It has a flat, neutral last, and stiff flat midsole for comfort. Comes with NEO Friction rubber. Both the velcro and lace version will be available in a men’s (wider) and women’s (narrower) last. 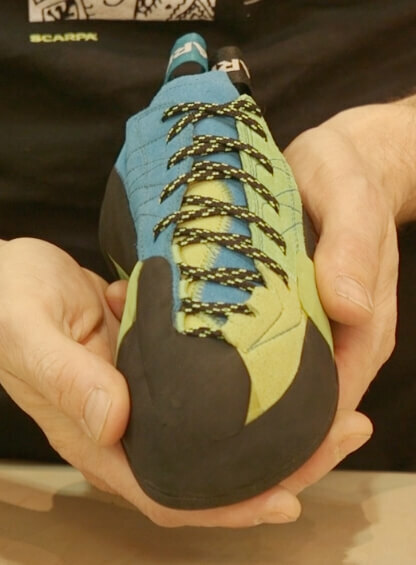 The Black Diamond Aspect is an all-around climbing shoe. It has a lower volume toebox to fit into cracks. It uses German-grade leather and NEO Friction rubber. The Black Diamond Focus is a super stiff shoe with an asymmetric last, slight downturn and also includes a supportive arch. It uses slightly firmer NEO Friction Force rubber. The Black Diamond Shadow is their highest performing shoe. It was designed to be super soft with a moderate downturn. This was designed for bouldering and very steep sport climbs where toe hooking and tensioning is a must. It uses NEO Friction Fuze rubber which is softer and stickier than either the standard NEO Friction or the Force rubber. The Momentum is available now at MEC and coming in October to REI, with a global launch January, 2018. The rest of the shoe models are expected to be released in 2018. The Butora Sensa is a performance slipper. 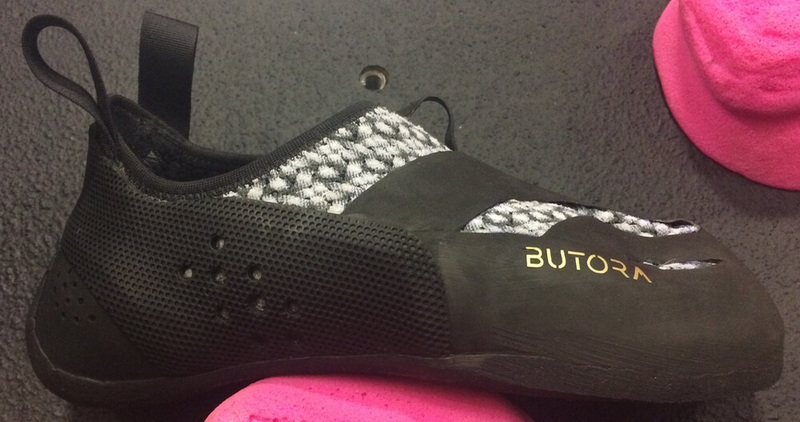 To increase performance, Butora is using an expensive knit fabric that stretches to accommodate the width of the foot but stretches very little along the length of the shoe. The heel is the same as Butora’s highest performance shoe, the Narsha, and has 4-way stretch rubber to accommodate many different heel shapes and sizes. And something we’ve never seen before: Butora is offering 2 mid-sole options in this shoe so you can choose a soft (minimal) midsole or a hard (bigger/thicker) midsole. It’s a cool idea to be about to choose shoe stiffness so you can optimize for sensitivity or support. When we filmed this shoe, Butora didn’t yet have a name for this model, but it’ll be called the Advance. The main goal of the Advance was to create a great shoe at a low price. Butora worked backwards to figure out how to pack in as many features as they could within that budget. Features: Organic hemp lining to keep the shoe smelling great. The mesh upper material is breathable, light, and strong. The laces are made of Dyneema for little stretch and long term durability. And there is an added polyurethane material laminated to the upper to keep the lacing structure from ripping. There is a moisture-wicking tongue and the same rubber as the high performance Narsha. Designed to be a climber’s first shoe, it’s flat lasted with a full length ABS midsole for edging support in the gym or outdoors. Built on the same concept but 2 different lasts, the Evolv Nighthawk and Skyhawk also have slightly different upper patterns to showcase the different volumes. Both models have all leather uppers that will stretch to fit your foot and synthetic overlays connect to the lacing system to ensure a consistent, secure fit. The goal was to make a super comfortable lace up shoe to complement the Defy and Elektra velcro closure shoes that have been some of Evolv’s most popular shoes. The Evolv X1 is designed for hard training in the gym. Helping to make your foot stronger, the X1 is very aggressively downturned and super soft. The velcro closure and aggressive heel maintain a secure fit. The minimal midsole is just enough to keep the downturn while still being super sensitive. Lots of rubber on the toe for modern toe hooking and scumming. The General is Evolv’s technical high top trad shoe. It’s designed to protect the ankles in big cracks and rough climbing areas. The goal was to create a shoe that offers great protection for the ankles, all day comfort, but technical enough to take advantage of small edges while face climbing. It has a layer of padding in the toebox for crack climbing comfort and Trax XE rubber for better edging. The leather outer with a synthetic liner will breath but won’t stretch and blow out. Named in honor of Kurt Smith, an 80’s Yosemite master. Evolv’s new flagship shoe, Oracle, is a lace-up that’s designed for “ultra high performance” climbing. If you’re going to buy one pair of shoes to do every style of climbing, this is what it was designed for. It features the big knuckle box area of the Shaman and the midsole and heel tension of the Agro. It also has strings that pull up the heel and arch as you tighten the laces (the first time we’ve ever seen a feature like this). A large toe patch provides coverage for overhangs and padding in the tongue for comfort. 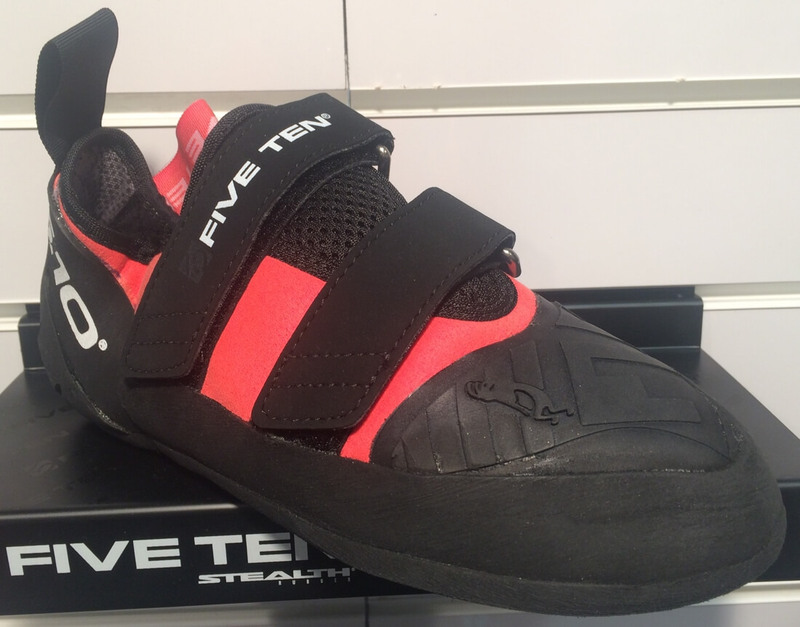 The Five Ten Quantum VSC is a velcro version of the popular lace-up Quantum. The VSC is built on the same last as the lace-up version, with a wide forefoot and pointy toe, and higher volume in general. It has a stiff thermoplastic midsole and a beefy one piece sole that provides support for edging (especially noticeable for heavier climbers). Stealth C4 rubber, Five Ten’s most versatile rubber that works well on all types of terrain. Compared to the lace-up Quantum, the VCS has more rubber on the toe for more modern routes. The VSC also has 3D rubberized print (grey dots) at the front of the upper to add a little more durability and reduce stretch. 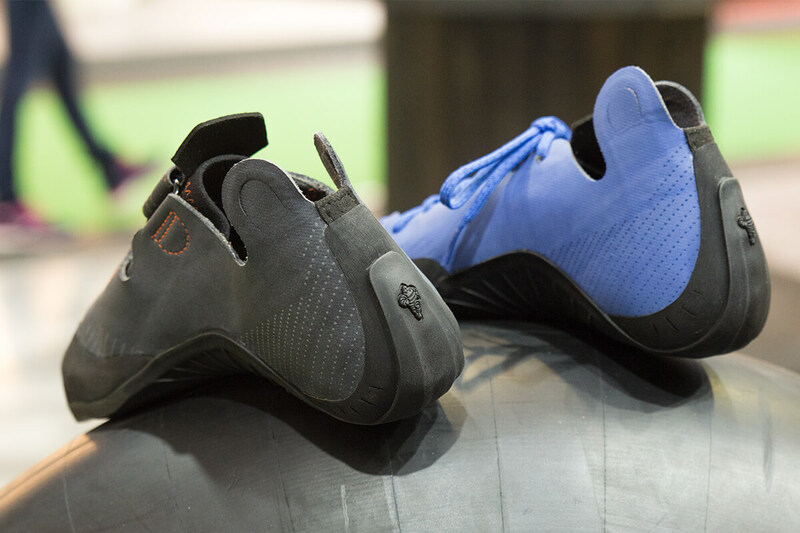 Five Ten’s Anasazi Pro started a few years ago when World Cup athlete Shauna Coxsey asked Five Ten if they could customize a pair of Anasazi’s with rubber covering the toe for her competition climbing. Five Ten agreed. After stellar feedback from Shauna, Five Ten figured others would enjoy the shoe as well and started prepping it for production. The rubber toe patch uses the softer, stickier Mi6 Stealth rubber. Otherwise the Anasazi Pro is almost identical to the classic Anasazi velcro: the same last, same Stealth C4 rubber, and same midsole. They did add a hair more heel tension for improved performance. Men’s and women’s (lower volume with a narrower heel and toe-box) available. Following the success of the soft, sensitive, and aggressive men’s Futura, La Sportiva is releasing the Futura Women’s with the same No-Edge sole and Vibram XS Grip rubber. The women’s model is built on a lower volume last than the men’s model, with a narrower forefoot and heel. Like the original Futura, the Futura Women’s utilizes the P3 rand platform to keep the shoe (and the climber’s foot) in a downturned position. The upper is also unlined leather enabling it to mold to the climber’s foot. Building on the success of the men’s Skwama, the Skwama Women’s will feature a lower volume last in the forefoot and heel. It’ll have the same midsole and split outsole as the men’s version, along with the S-heel construction of the Skwama/Otaki line. It utilizes the P3 rand platform to keep the shoe (and the climber’s foot) in a downturned position and a large rubber toecap for volume creativity and tension based climbing. 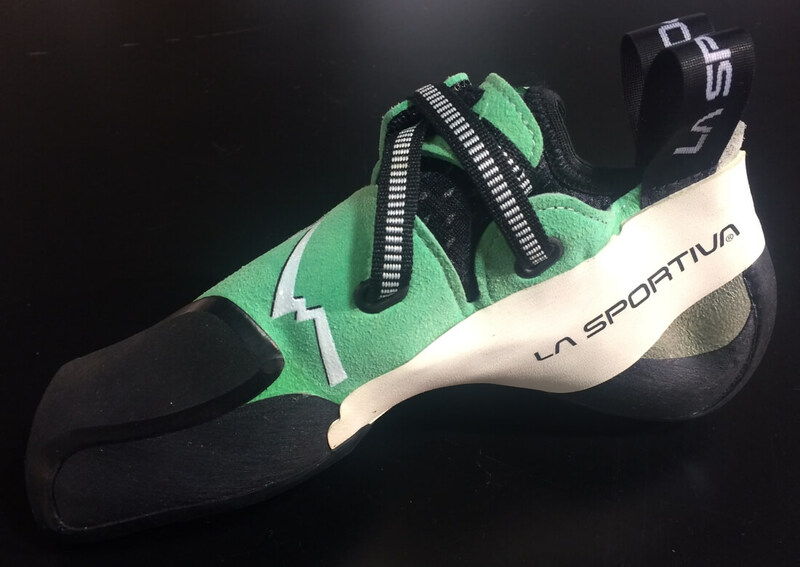 It’s a softer, more performance orientated shoe prioritizing sensitivity, downturn and aggressive foot position for steeper sport, bouldering and competition climbing. The La Sportiva Cobra slipper was removed from the North American line for a few years, but now it’s back, in an Eco edition. The Cobra Eco is very similar in design improvements to the Mythos Eco, emphasising environmental responsibility, reducing waste and recycling. The rubber is fully recycled from the production of other shoes (ie, small scraps from the Solution and Genius, etc). The leather and nylon are environmentally sourced, eco-tanned and use water-based glues and dyes. The Cobra Eco slipper will be great for crack climbing if you go up a size or it can perform on the steeps when you downsize. The La Sportiva Gecko Gym was designed for indoor climbing and training (although you can certainly go outdoors with them). La Sportiva used their XF 2.0 rubber for maximizing durability. The Gecko Gym has a powerful midsole to support the foot during long days in the gym. A split outsole makes it easier to resole when the time comes. It’s built on a comfort oriented last with minimal asymmetry or downturn. Most notably, the Gecko Gym is washable – train all day, and when it’s starting to smell you can toss ’em in the washing machine, let it air dry, and you’ll be ready for the next gym sesh. The Rocket Lace has Vibram XS Grip rubber on the bottom toebox (where it matters most), and with a plentiful rubber covering of the top of the toe for toe-hooking. It also features asymmetrical lacing which LOWA says will accommodate an even wider variance in foot volumes/shapes. Chromium-free leather upper for breathability and it’s unlined which means it will conform (stretch) to your foot more than a lined/synthetic shoe and also add more sensitivity while climbing. It’s downturned, so it’s designed to excel at steep climbing whether that’s bouldering or sport. After a brief half year hiatus the Mad Rock Flash 2018 takes over from the Flash 2.0. Keeping their best selling last, but adding improvements like climbing grade rubber on a more sensitive heel. Mad Rock also added a new stretchy tongue that’s more breathable than traditional padding. They have kept the toebox the same as the Flash 2.0 because of the great feedback. 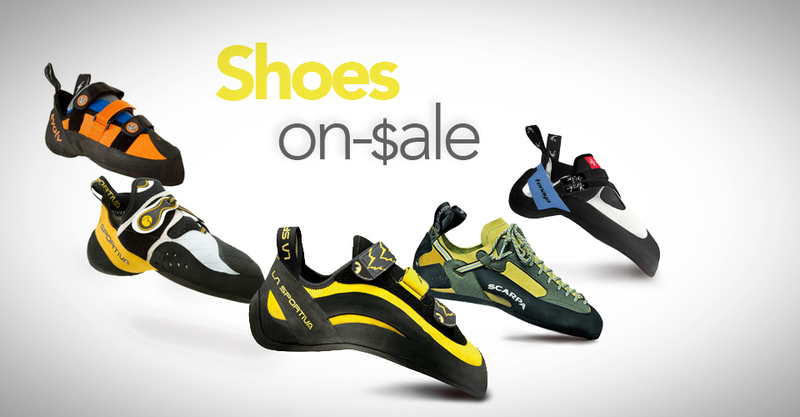 The Drone climbing shoe improves upon Mad Rock’s best selling high performance shoe, the Shark. The Drone incorporates a pointier toe-box for more precision in pockets and on edges. It also has a longer sole for increased support shoe and a more technical rand to hold the shoe shape. It also has a thinner heel for more sensitivity. The heel is also expandable to accommodate larger heel sizes. The Drone uses Mad Rock’s newest tongue material which is breathable and won’t hold moisture like tradition padding. The enormous toe patch isn’t connected to the rand which allows it to stretch for more comfort. The Drone be available in two versions – high volume (blue – pictured) and low volume (green). 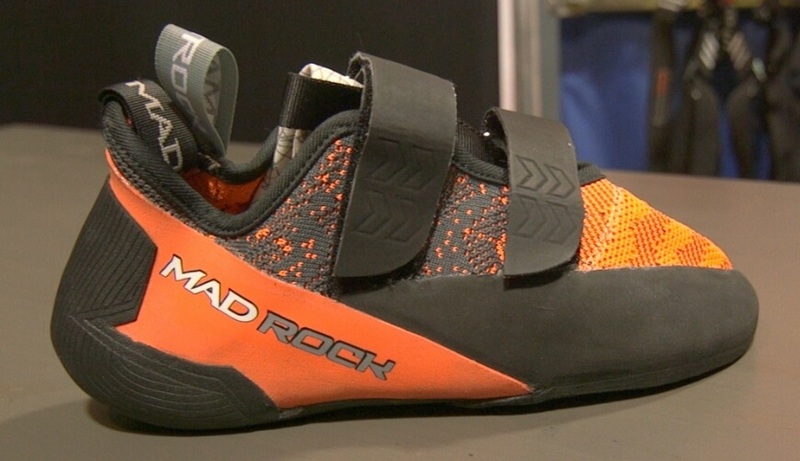 Mad Rock’s Weaver uses knit technology that’s been in athletic shoes and is beginning to make its way into climbing shoes. This knit is breathable, stretchy, and comfortable for all day climbing or full session gym climbing. Some of the knit stretch is controlled by the rubber, and the knit has elastic properties to help it go back to it’s original shape. Based on the Flash 2.0 last (Mad Rock’s best selling shoe) which fits a wide variety of feet, the Weaver has the most minimal 3D heel cup that Mad Rock has ever produced. This makes it more sensitive and more comfortable for a wider variety of foot shapes. 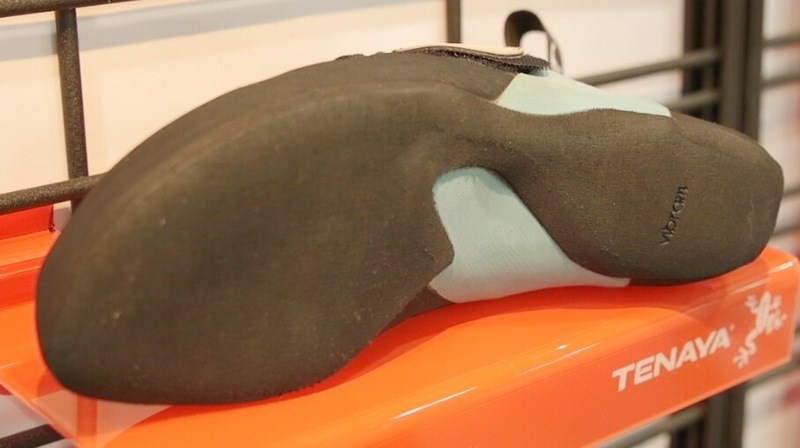 The new synthetic tongue is breathable and stretchy (not padded). 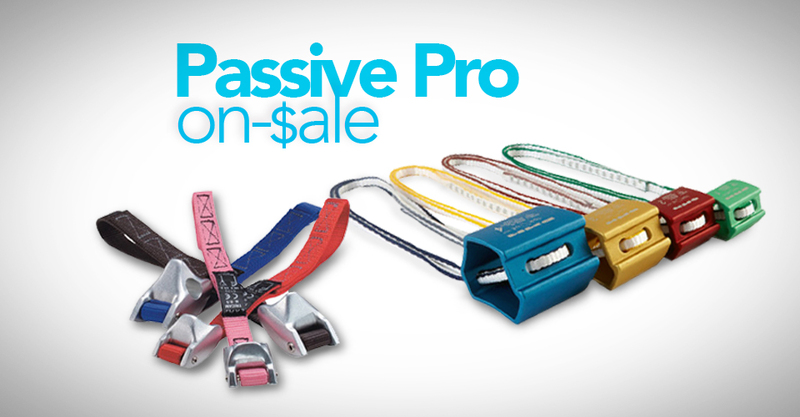 The laminated straps are designed so you can cut them to fit, which is great for narrow feet. Red Chili has come out with a low volume version of the Voltage – the Voltage LV – it has a narrower, lower volume forefoot and a narrower, lower cut heel. It uses Vibram XS Grip rubber for the outsole, and includes a high performance, sensitive heel, and a custom molded mid-sole that keeps the downturn in the shoe for the life of the shoe. 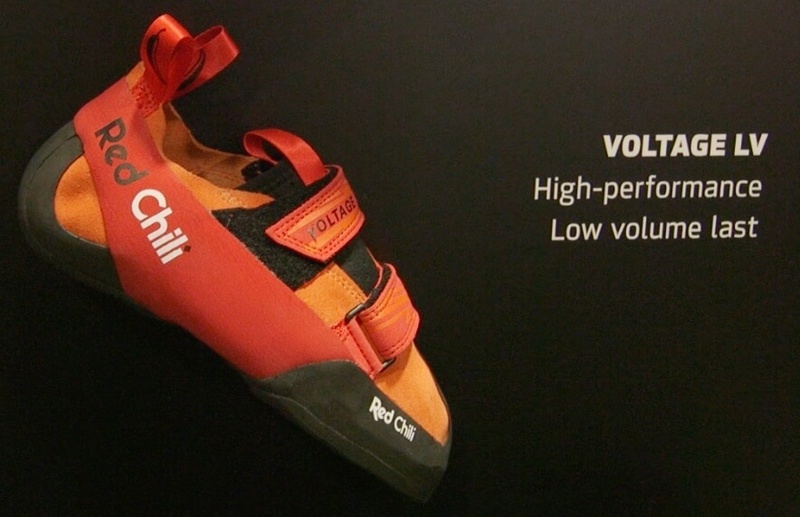 Red Chili’s Charger LV is made for a new climbing generation focused on indoor bouldering as a fitness sport. This shoe is extra comfortable with a full leather upper, flat last, and a double rand to ensure the toe-box will last much longer against abrasive indoor climbing walls. A stiffer midsole offers a lot of support for feet new to climbing. A very asymmetric and steeply downturned shoe, the Furia S is aimed at high level climbing when you have a smeary, toe/heel hooking project. This “S” model is an evolution of the previous Furia. It has one specialized strap that will also work great with narrower feet — compared to the 1-strap Drago that can be challenging to fit narrower feet. 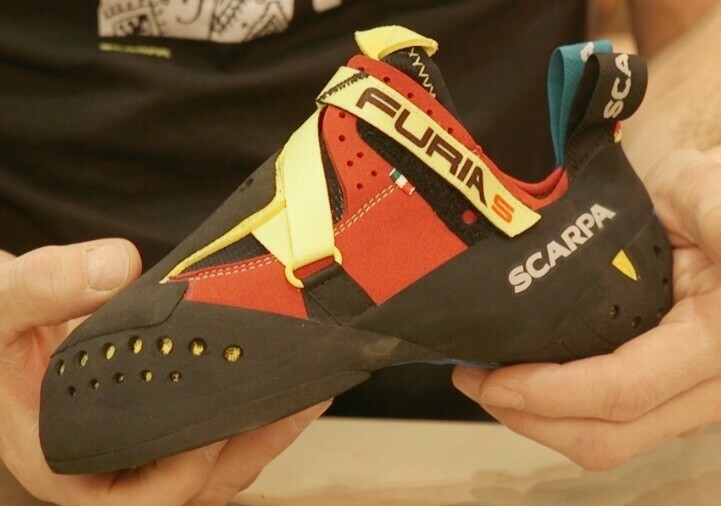 Overall the Furia S is a very sensitive, delicate, and softer shoe where you can climb with the top of your foot as much as the bottom. It will excel at smearing, toe hooking, heel hooking and situations where your foot is basically acting as a hand. It’s great for Fontainebleau-style climbing with slopers and sandstone. The Mago is the most supportive (stiffest) aggressively downturned shoe that SCARPA makes. It’s designed for front pointing and holding onto really tiny holds. If you used to climb in the Mago, it’ll have a similar feel but with many extras. It has a suede and synthetic upper so it will conform to fit your foot, but also not blow out. It has XS Grip 2 rubber and even more rubber coverage on the toe than previous Mago, but that’s not the focus. The Mago is made to grab the smallest crimps, this is why there is a roomier toebox, for curled crimp-ready toes. It also includes a small plastic strap in front for even more support on tiny edges. A great shoe for high arches and it’s lighter than Stix/original Mago. The Mago will excel on tiny tiny granite edges, and its features will be most noticeable on especially steep and hard granite routes. The Maestro collection uses eco leather for the upper. This means the leather is sustainably sourced and uses an eco-friendly tanning process that results in a soft hand. A complicated and very new shape of the active randing allows for a very supportive shoe that is also sensitive, instead of very stiff like many trad shoes. Paying attention to the details, SCARPA has moved the inner seams away from the toe and the top of the toe box to maximize comfort. The tongue also has an extra disk of padding at the front of the foot for comfort. A Vibram XS Edge outsole maximizes edging and durability performance. The Maestro is an all day shoe that trades the added ankle protection of the Maestro Mid (below) for more technical face climbing and edging abilities. The Maestro Mid, like the Maestro (described above), uses eco leather for the upper. The leather is sustainably sourced and uses an eco-friendly tanning process and results in a soft hand. A complicated and very new shape of the active randing allows for a supportive shoe that can also be sensitive – instead of a very stiff shoe as trad models often are. SCARPA has moved the inner seams away from the toe and the top of the toe box for improved comfort. The tongue also has an extra disk of padding to cushion the forefoot. The Vibram XS Edge outsole maximises support for edging and durability. The Maestro Mid is ready for big cracks and long days. 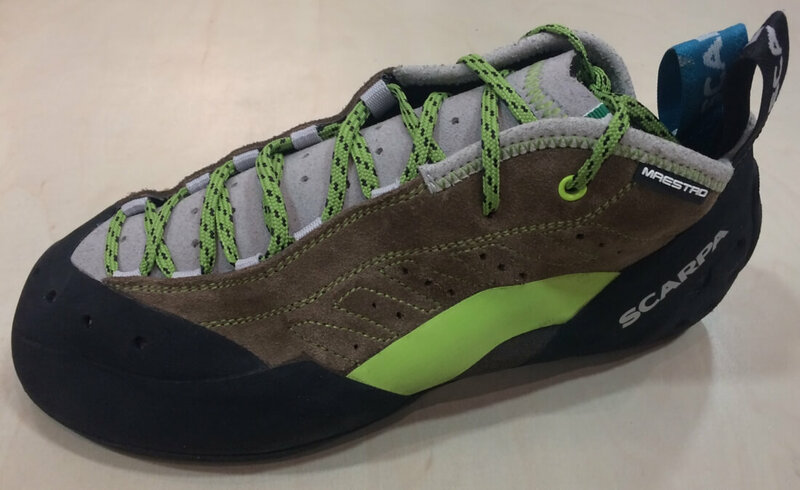 It’ll be SCARPA’s most comfortable performance trad shoe. The Maestro Mid women’s will be the first female specific (narrower last and lower volume) hightop climbing shoe on the market. SCARPA Note: Since we were filming at the US shows, we didn’t capture the Instinct S which will be available in Europe in 2018. At this point it’s unknown when the Instinct S will come to the US market (either very late 2018 or early 2019). The Oasi LV is a high performance, aggressively downturned, semi-split shoe for more sensitivity. The original Oasi came out in 2014 and has been a big hit, yet it’s fairly high volume. The Oasi LV is a lower volume version of that same shoe – it’ll have all the same performance and components. The LV is also velcro (vs the Tarifa which is nearly the same shoe except it’s a lace-up). The velcro lacing system is double-backed for relieving hot spots and is well-known for its micro-adjustability that can accommodate a wide range of foot shapes and arches. Synthetic upper, cotton liner, and Vibram XS Grip for the outsole. Wild Country debuts 2 models of shoes, the Mashuga and Parthian. These shoes were designed in conjunction with the Michelin® Moto G team to create a rubber compound which took nearly 2 years of development. Michelin® engineers compared all the rubbers on the market and worked to create the ideal balance of grip, edging properties, and durability. The rubber outsole is 3D molded for precision. The uppers also look quite different because they have a thin layer of polyurethane (PU) rubber sandwiched between 2 layers of microfiber, which create an internal skeletal system. Note: All all other climbing shoes use an external slingshot rand system utilizing rubber that is 3x-10x thicker than PU. 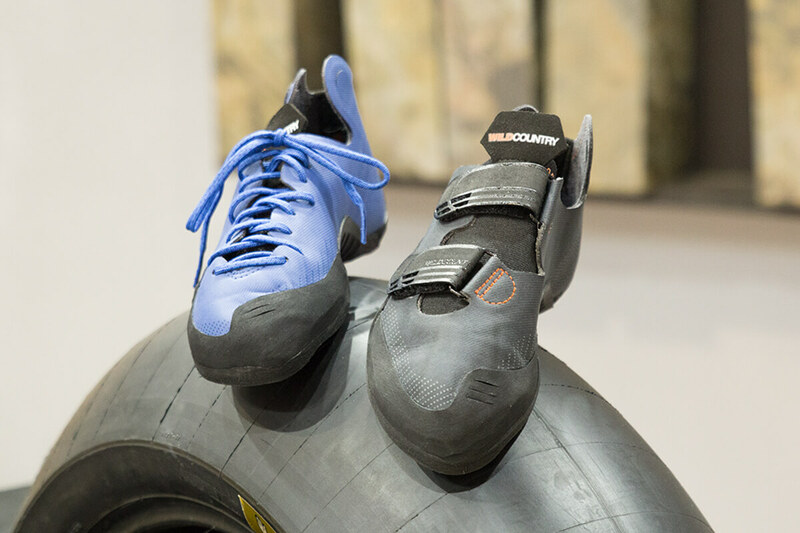 By using this construction Wild Country significantly decreases the weight of the shoe, as PU is far lighter than typical rubber for the same elasticity. The Wild Country Mashuga is more sport climbing and bouldering oriented with velcro straps, a moderate downturn, slightly asymmetric shape, more tension in the heel, and a larger toe-box for curled toes. It has no midsole, but has a very unique overknit fabric design that wraps under the foot so the shoe contracts around the foot when the toe is weighted, providing support. The Wild Country Parthian is a crack climbing lace up with a straight last, slight downturn, and low profile, allowing for precise footwork on small holds and pockets. Based off the same last as The Street, the 2020 Gold was designed with synthetic materials for minimal stretch. An ultra thin midsole provides a softer more sensitive fit, creating an extremely lightweight aggressive climbing shoe. More details on WeighMyRack. Based off the same last as The Street, the Tokyo Streets were designed with synthetic materials for minimal stretch. An ultra thin midsole provides a softer more sensitive fit, creating an extremely lightweight aggressive climbing shoe. More details on WeighMyRack. The Street LV (lower volume) provides a tighter fit for those with a more narrow foot width, providing better heel tension and higher performance. The LV is our most soft, aggressive shoe in the line – designed with our Dark Matter Rubber, in seafoam green, featuring minimal stretch and an ultra thin midsole which provides a softer, more sensitive fit. More details on WeighMyRack. You can buy all of these shoes today from So Ill’s website. 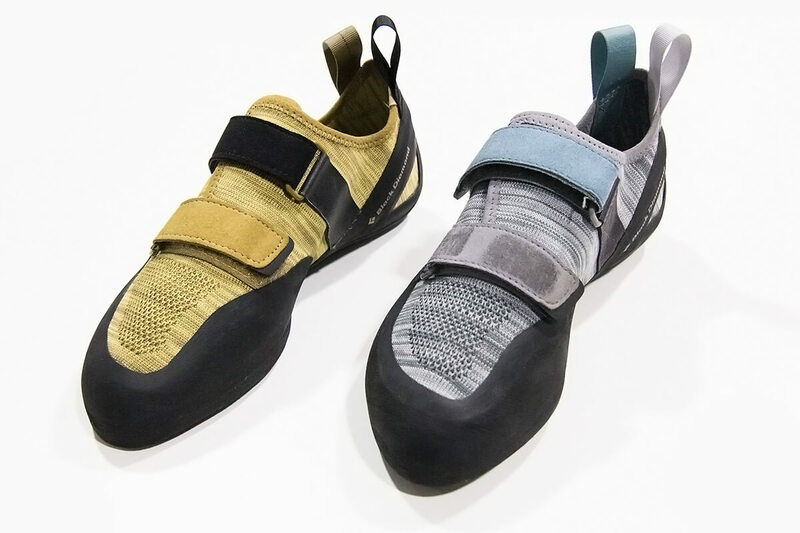 A high end, downturned shoe, the Tenaya Mundaka is made for steep sport climbing inside and out, as well as modern bouldering requiring tensioned moves. It’ll be the most downturned model in the Tenaya line with a large rubber wrap over the toe, and a heel rand designed for aggressive hooking. It has a split, Vibram XS Grip outsole, synthetic leather, and Tenaya’s well known strap system for micro adjusting to a wide range of feet. More details on WeighMyRack. The Mundaka is out now (we’re keeping it in the 2018 roundup so it’s not missed completely!). You can buy it directly from Trango. Wow this is such a great list. I had no idea about 80% of these shoes where being manufacturered. Thanks for putting this all together I really need to get another pair for the upcoming fall season. Thanks for the video reference, Tom. I’ll have to send La Sportiva a note and see if I can get a more detailed story. I also saw those videos. I now have tried the Skwama and the Skwama Woman myself and the Skwama is too wide for me in every direction. Also the heel is way too big, too deep, too high volume etc. The Skwama Women fits way narrower and also the heel is much lower volume. It feels sizewise like my Otaki heels (Otaki EU 42,5, Skwama Woman EU 42). Pietro talks … in this video. The Futura Woman i don’t know, but the Futura is already so soft, why making it any softer? But the heel is too big and baggy, so, make them narrower + lower volume! BUT: With the Women’s Otaki, tried and tested and climbed myself, both brand new out of the box EU 42,5, fit exactly the same! Just the Skwama Women feels softer. I thought just the rubber changed from Vibram XS Edge to XS Grip 2, but the inner feeling… it is like the shoe is 1/4 EU size larger. Probably the material is thinner, therefore the shoe feels softer and therefore “larger”, or the padding is softer and thinner. I don’t know. But the shoe is more comfortable and the softer and stickier outsole bites into the rock. I’m male, 1,80m and with 83kg quite heavy for a climber. Unisex Otaki replaced my Miura VS and will now be used for route with micro edges to stand on exclusively. Otaki + Otaki Woman (or Women’s). Otaki: Vibram XS Edge, Otaki Woman: Vibram XS Grip 2. Replace Skwama with Otaki in the sentance “Just the Skwama Women feels softer”, 2 lines under the “BUT”. I have tried the “normal” Skwama and am now climbing the Skwama Women’s. There is a BIG difference in fit! I have normal width feet (on the wider end of Sportiva or the narrower End of Scarpa), low volume (low instep) meaning a Miura VS or Python has too much room on top of the foot (still climable though), germanic feet with ägyptian toes, and low volume heels. The normale Skwama is too wide and high and everything, for me. Especially the 3 times too large heel cup is the same sh*t like the Solutions heel. The Skwama Women’s however, is narrower, fits me perfectly and the volume of the heel is greatly reduces, approx. the size of the heels of my Otaki. I have shoes size EU 45 and the Skwama Women’s fit in the largest size available (42) perfectly! Really comfortable the thin leather! Let’s see how much they stretch over time. Btw, they are “stiffer” than expected! I was ready for something like in between Solutions and Python, but i think out of the box it is stiffer and gives more support than Solutions. Also stepping is FAR better, since the stupid plastic extension of your big toe in the Solutions keeps your toe away from the rock/wall, making it less sensitive. Exactly the opposite of what all companies, also Sportiva with their no edge outsoles are trying to do: Getting the toes closer to the wall for more sensitivity!